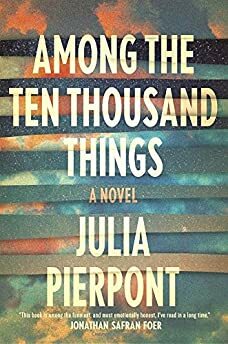 Largehearted Boy: Book Notes - Julia Pierpont "Among the Ten Thousand Things"
Book Notes - Julia Pierpont "Among the Ten Thousand Things"
Julia Pierpont's Among the Ten Thousand Things is a remarkable debut, a novel wise, honest, funny, and heartwrenching. "The perennial theme of marital infidelity is given a brisk, insightful, and sophisticated turn in Pierpont's impressive debut. . . . This novel leaves an indelible portrait of lives blown off course." I don't generally listen to music while I write. If it's a noisy day at the library I might play something instrumental--jazz or classical--on headphones, but more often than not I find it to distract from the rhythm of sentences. I do, however, like to listen to music on the subway route to wherever I'm writing. For this novel, that mostly meant taking the C train from Morningside Heights down to the library at NYU. I should add that I'm a sucker for lyrics, partly as a writer but probably also because I have no formal music education beyond the plastic recorder we were all taught to play in elementary school. I just know what I like. I love how James Murphy’s love letter to the city reflects the way we often really feel about the ones who are closest to us—conflicted. It’s a series of love/hate contradictions—"New York, I love you but you’re wasting my time"—that ultimately lands on the conviction that "you’re still the one pool where I’d happily drown." It’s that relationship of highs and lows that you should maybe end but never do. My novel opens with a letter from mistress to wife, which is what this song is about. Structurally it’s so great, and I love that you come to realize that the two women were actually friends, and it becomes clear that they might each be better off without this man in their lives. Jenny Lewis’s delivery at the end of the song—"your husband will never leave you, he will never leave you for me"—is gut-wrenchingly good. This is off Kweller’s debut album, which came out when I was in the tenth grade. It will always make me think of high school, and of my fifteen-year-old character, Simon, who’s so angry in such a really sweet, relatable way, and his feelings for a girl he meets that summer, Teagan. "Why am I dealing with this feeling? It's easy, but it seems so hard. You're near but you seem so far." Another album that came out when I was in the tenth grade. This song seems very much to be about the tragedies of September 11th, 2001, but in fact it was written before. The novel is set a decade after the towers fell, but 9/11 has been a recurring theme for Jack, the Shanley patriarch and a visual artist, and it’s a recurring theme for anyone who lived in the city during that time, artist or no. This is such an exquisite song about falling in love. It makes me think of Deb at age twenty-two, when she’d just fallen in love with Jack, and those nights she stayed up unable to sleep. "Your light overwhelmed me," Holland writes, which is just the way Deb felt about Jack, enchanted. This song is for Deb, the wife and mother in the book. I can see her singing along to this while making pasta and broccoli in the kitchen, thinking of her youth and the choices she made, wondering where to go from here. On the flip side, here’s a song for Jack, who’s still listening to the same music at age fifty-five that he did living in his parents’ house back in Texas (where a Rolling Stones poster still hangs in his room). Thematically, the lyrics here really speak to the trouble Jack gets himself into as well. There are so many National songs I could use for this playlist, their lyrics are just that good. This is a song about very mature subjects—the state of constant worry that comes with being a partner and a parent—the pressures inherent to adulthood. "Oh we dream a life," Taylor writes, "and just like that it’s done." Another great lyricist, and this is a song about time and endings and how quickly it all goes by. She relates a span of seven years to no more than "a flicker of neon sign."